Ever thought about pine tree as a suitable ice cream-flavour? Ever wondered about what would happen if you combined saffron with pine and tried to eat it? If so, read on! 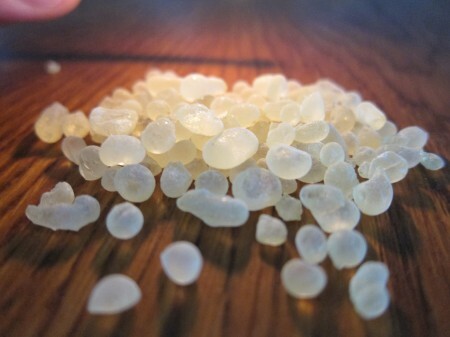 Mastic is an aromatic, amber-like resin, and dries into hardened, brittle drops. And the taste? To me, it mainly resembles that of Pine tree. Yes, really! Mastic is a common ingredient in several recipes for Oriental style ice cream. It is the resin from the Mastic tree (Pistacia lentiscus), traditionally produced on the Greek island of Chios. While this little tree can be found also in other places, it is seemingly only on Chios they “weep” their resin when cuts are made in the bark of the branches. The hardened sap of the Acacia tree – Gum Arabic – looks very similar to Mastic, and is also used in some oriental ice cream recipes. 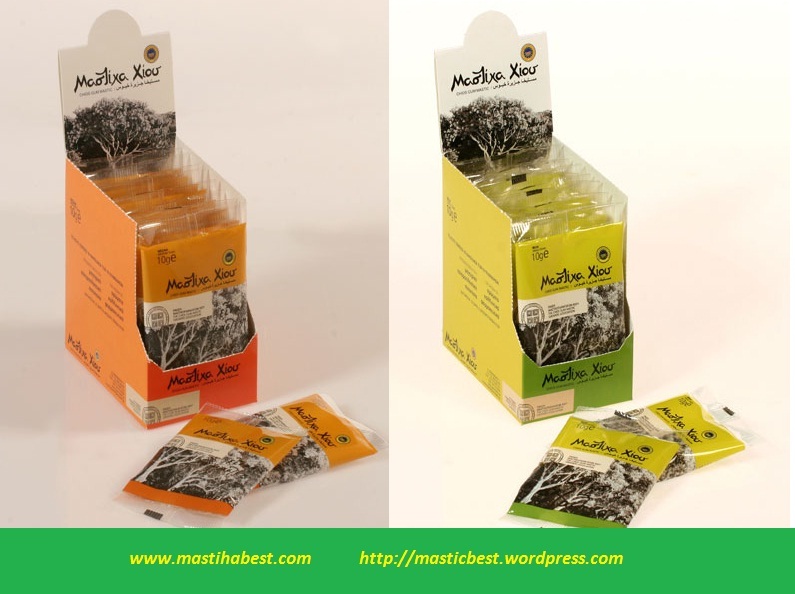 While both count as natural gums, Mastic and Gum Arabic (E 414) are, however, different products (with Mastic having much more aroma and taste than Gum Arabic). I have noted that Mastic as a flavour evokes quite diverging reactions. They seem to range from “euuuch … I can’t take this!”, to “Mmm … fantastic”. Some of my Greek friends tell me that it is an acquired taste, and many suggest that a second chance be given to the flavour of Mastic if not initially pleasing. Chez moi, the Mastic ice cream had the same dividing effect at first – some liked it a lot, whereas others did not like it at all. Myself, I was left on the fence, wondering whether it was the mastic or just my combination of flavours that made the ice cream so divisive (read more below about this, my not-so-successful, attempt, with mastic and saffron). Deciding to give mastic a second chance, I adjusted the recipe somewhat and found a flavour-balance appreciated by all around the table! This was an ice cream I could vouch for! Intriguing ice cream prepared with aromatic Mastic resin - the flavour reflects this well: imagine a discreet blend of sweetness and pine! Optional: Sprinkle with chopped pistachio nuts and serve with sour cherry syrup (or jam) on the side. Pulverise the mastic (since it is a resin, it will be easier to handle if you first freeze it for 10-15 minutes and then put the resin drops together with a couple of teaspoons of sugar in the mortar). Whisk together the corn starch and 200 ml (about 0.8 cup) of the milk, making sure that no lumps are left. Set aside. Whisk together the pulverised mastic with the rest of the milk/cream and the sugar. Heat until steaming hot and until the mastic has dissolved. Just before reaching a boil, add the corn starch-milk. Stir continuously on low heat to avoid any lumps for about 5-10 minutes, until the mixture has thickened sligthly. Remove from the heat and let the ice cream base cool down. Refrigerate for a couple of hours, then freeze according to the instructions of your ice cream machine. Mastic sure does brings a very peculiar taste (roughly speaking, think "Pine tree"!) to the ice cream, However, the proportions above should ensure a subtly flavoured ice cream, likely to be agreeable to most people. Do be cautious if you want to have a stronger mastic flavour - in terms of strength, even a little of the "Tears of Chios" go a long way! Stick to the indicated amount, at least until you know for sure that you will like it! Genuine mastic resin comes from the Greek island Chios (Χίος) and has a history as old as … well, ancient Greece itself. Given the lack of proper ice cream in the ancient days, however, the satyrs and nymphs of Chios probably used mastic as chewing gum. Do try chewing mastic yourself! Probably being one of the oldest chewing gums in the world, mastic will certainly refresh your breath. According to tradition, it will also prevent tooth decay and improve gastrointestinal health. I have been told that at least in Greece, Mastic ice cream (or Kaimaki, as it is called there) is often eaten “on its own”. Or used in a way similar to vanilla – as a versatile ice cream that goes well with most anything sweet and baked. Given the number of different pastries, this opens up for quite a wide number of possible combinations to try! Sprinkling some chopped pistachios on top of the ice cream, possibly also serving a sour cherry syrup (or jam) on the side, are other classical serving suggestions. And as you noted, this is the version of mastic ice cream described in my recipe above. 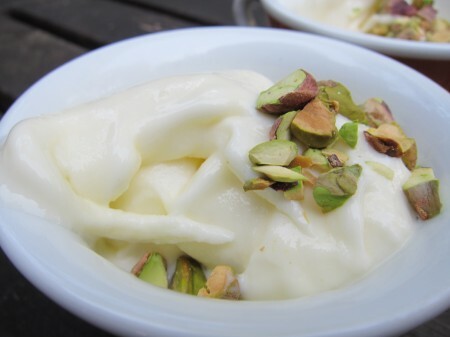 Mastic and Salep (the latter a flour made from an endangered species of orchids, mainly growing wild in Turkey) is a classical oriental ice cream combination. Since the orchids necessary to produce genuine salep are endangered, however, legal trade is restricted. While waiting for successful attempts to cultivate and breed the required orchids, ethically minded people who care for the global flora should preferably stick to substitutes. I have written more about salep, salep ice cream and the search for salep-substitutes here. 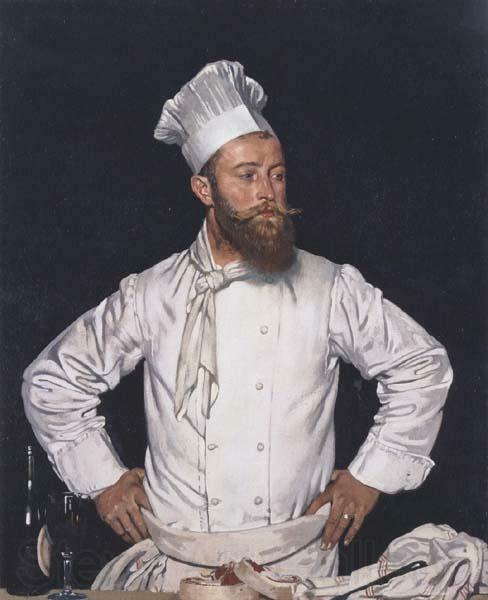 There are quite a number of recipes suggesting “typical” oriental flavours to accompany the particular one of mastic. Keiko at Nordljus has written a beautiful post about when she tested mastic with rosewater and cardamom. What can I say? The colour turned out beautifully. The shape-retention was superb. But the taste of it … perhaps I overdosed the mastic (using about 3/4 of a teaspoon), perhaps I should have used cream and not only milk. Or perhaps the flavours just aren’t meant for each other. Imagine crossing saffron – with its velvety-soft, complex taste – with a rather coarse pine tree or a cedar. The fusion of flavours certainly retained a part of the saffron. But instead of the soft and appealing “ending” which saffron often delivers, the palate now had to suffer a more brutish one, loaded with resin and pine. Take my word for it – this combination should be avoided! Fascinating ice cream recipes, Anders, especially the one with mastic, which I’d really like to try — but where can one buy mastic (mastix på svenska, I think) in Sthlm? Hope you can help! The mastic recipe is indeed fascinating, but unfortunately, I have no idea where to find mastic in Stockholm. The only mastic sold in Sweden which I managed to find via google seemed made for make-up purposes (where the mastic is used as an adhesive), and may contain things you do not want to end up in your ice cream 😉 . 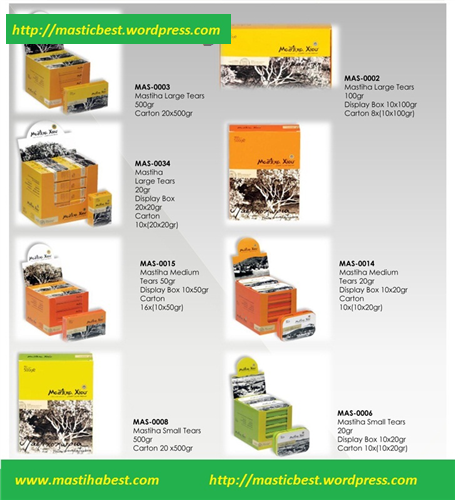 So unless you or someone you know are planning on going to Greece (there is a major shop dedicated to Mastic and mastic-products in Athens), I fear that mail order might be the easiest way of getting hold of it. Best of luck! I tried it in a vegan version, with soy milk to replace the milk and coconut cream to replace the cream, and it came out just great! I just come back from Cyprus and discoved Mastica ice cream…..Absolutely fantastic!!!! I love it , I will try to make yours ( I have several jars of mastika…) with the 90 seconds suggestion. Thank you. Hi, I have been trying to make a mastic flavoured soda, but Im have huge problems in dissolving it. I grind it and the add it to cold water. When i heat the powder turns into glue-like particle that stick to anything and only can be removed with Acetone. Should I only heat to 40-50 C or ? I must admit that I’ve never tried to make soda on mastic, but it sounds like an interesting project! One possibility you might want to try could be to add the finely ground mastic directly to boiling water and see if that does the trick. Best of luck! I tried to add it to a hot sugar solution and the result was the same. I got the soda when I was visiting Chios some years ago, and now I would like to make it myself. The taste of the soda was really refreshing. Hello Jesper, you must use mastic oil aroma in order to achive this which we can sell you we are also can send you mastic water to add to your soda and we can send you mastic soda all ready made feel free to write to me. Hi, Do you ship to Denmark ? It could be interesting to try the oil and water. What is the volumen of the two items and price? hi..wondering can we dissolve mastic gum into a liquid like water to drink? Heat the water and the sugar, mixing until the sugar is dissolved. 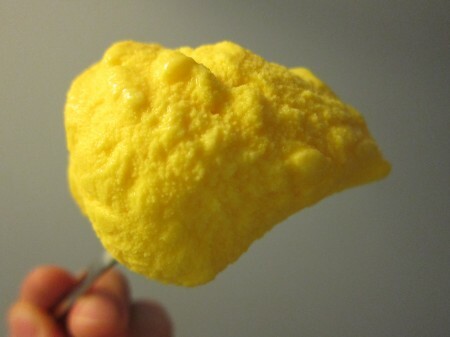 When it reaches a boiling temperature, add the citric acid and boil for 20 minutes in low heat. Let it cool for a while and add the mastic while still warm. Add the drink when the syrup has got cold. Place in a bottle and seal well. There is a seller called Steenberg on Amazon who sells a 13g pot of mastika drops. I have just ordered some and will be adding to the middle eastern sweet called cream kanafe. 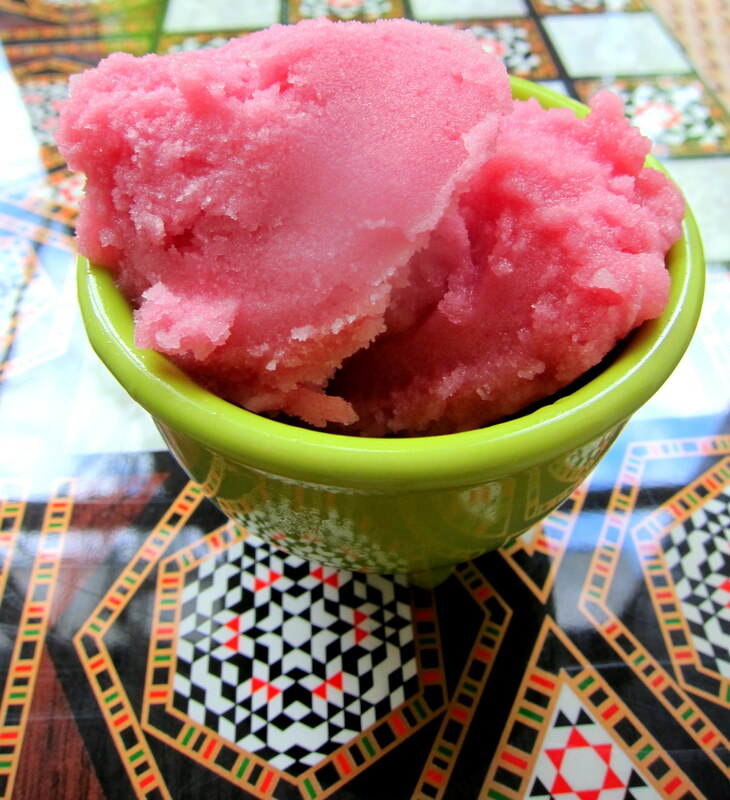 Have you ever used gum acacia/ gum arabic in ice cream? It is very similar to in properties to the mastic gum but it is obtained from the hardened sap of the acacia tree found in some parts of the middle east and south asia. It helps prevent the crystalisation of sugar, is tasteless and dissolves in cold and hot water. Although very high heat can change the way the gum will behave. Yes, although I don’t think I have posted any recipe with gum arabic here yet. Thanks for reminding about the gum! It is v ery efficient as far as I can recall (although you, of course, miss out on the “pine” aspect of mastica ;-)). 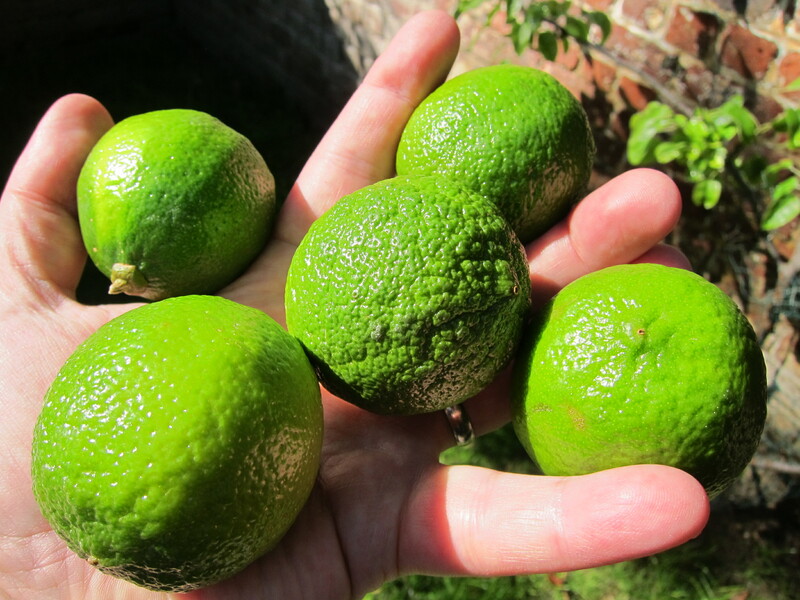 Previous story Garlic ice cream – cure for all evil?